Second Girl (Angel Adedokun), First Girl (Sharon Shao), Third Girl (Caitlin Tabancay Austin). All photos by Ben Krantz Studio. Second Girl (Angel Adedokun in foreground), Pig (Erin Mei-Ling Stuart above and rear), Ensemble. 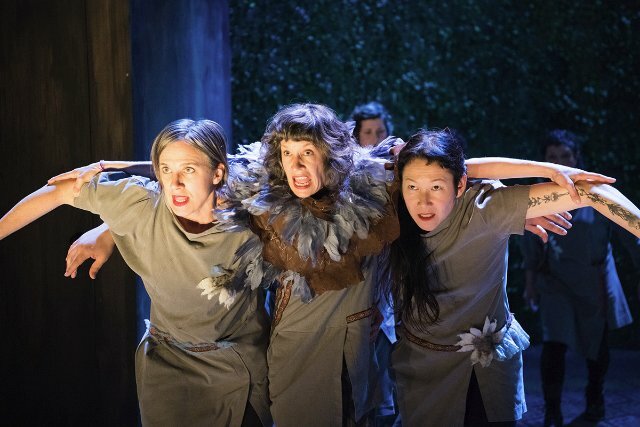 Falcon (Rowena Richie in center), Ensemble (Melanie Elms, Erin Mei-Ling Stuart left and right). 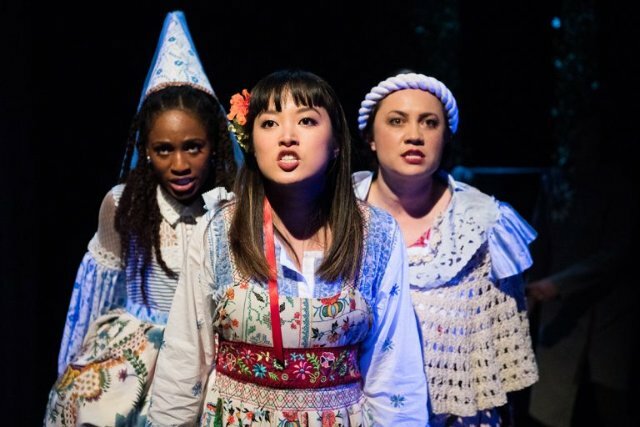 The world premiere of Iron Shoes is an unlikely mash-up of three adapted Russian and Romanian folk tales accompanied by a score inspired by Slavic and Caucasian folk music. Collaborations of art organizations are well intended but often produce outcomes with the whole being less than the sum of the parts. Happily, this co-production of Shotgun Players and Kitka Women’s Vocal Ensemble mines a rich vein and results in a stunning theatrical event. Many theater goers may be unfamiliar with Kitka, but understanding that group helps to understand the play. This Oakland-based, female vocal ensemble marks 39 years as a celebrated interpreter of the polyphonic music of Eastern Europe and Western Asia, having performed and collaborated internationally with many partners of note. Their a cappella polyphonic sound is remarkably rich, layered, exotic, and haunting. The novice to this form of music (i.e., most of us) may find similarities with Gregorian chants. Iron Shoes has evolved from its initial state as a song cycle performed by Kitka and written by its member, Janet Kutulas. Seven of its members perform as chorus and ensemble in the play. The fables themselves are of the “scare the holy hell out of the kids and teach them a lesson in life” variety. The first two share a common start point with a most celebrated fairy tale also having two bad sisters who get treated well and one good sister who is abused. In the first, the good girl’s love interest is severely harmed, and in the other, she is forced into an unseemly marriage. In the final story, the arms of a girl are wrongly severed, and she must care for her child without a husband. Common threads among the tales are that the central character is a female and each persists in the face of adversity. An additional element ties the stories together as each protagonist suffers the burden of donning iron shoes on their treks until the iron has worn away. But the magic is not so much in the stories but in how they are told, and director Erica Chong Shuch creates a delightful and sometimes phantasmagoric milieu. Sean Riley’s fixed set is simply three tall walls fully draped as a forest in ivy and a floor decorated with tribal carpet motifs. Sheds on wheels that come and go allow for some humorous interior action. Allen Willner’s perceptive lighting shows the stage well, and occasional use of a stage darkened except for hundreds of projected starlights is particularly appealing. Finally, the movement of many players with stylized depictions of motion energizes the stage. 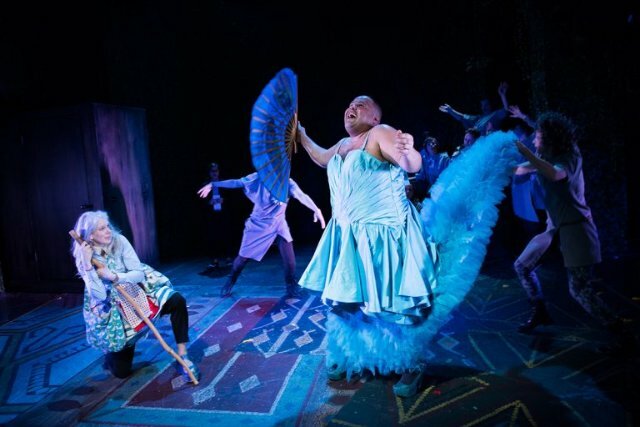 Actors become a falcon flying and a pig wallowing and embodiments of celestial bodies – each captivating in its own way. A conceit that ties the stories together is the use of an on-stage narrator in the person of Beth Wilmurt, who dazzles with just the right mix of authority, insensitivity, obliviousness, and wry wit. Speaking to the players, she often exhorts the hapless heroines to “buck up.” In an unusual twist, she is tasked by the three girls to a different responsibility in the second act, where she must learn to follow some of her advice to others. 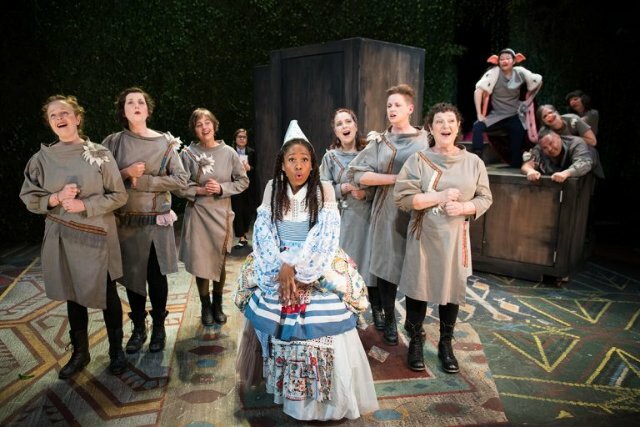 All of the acting is effective, even the small parts played by the Kitka singers, but another standout is Angel Adedokun who plays the sassy second girl with relish. What is really special is the resonant music that binds the narrative. Several Kitka choristers are always around in one activity or another. Their songs fall into two categories. The English language ones drive the plot forward, while others sound like they could be nonsense syllables, but in fact they in are slavic languages, which are no more understandable to most. Some of the most striking music comes from the tremulous solo work by Briget Boyle. The story lines of Iron Shoes are simple and somewhat predictable with feminist tropes. However, they are delivered with great enthusiasm and charm and provide delightful entertainment as good fairy tales should. Oh, and as a result of previews and word of mouth, Shotgun has already announced two extensions of the run. Iron Shoes, a world premiere, is created by Janet Kutulas, Michelle Carter, and Erika Chong Shuch, produced by Shotgun Players and Kitka Women’s Vocal Ensemble, and plays at Ashby Stage, 1901 Ashby Ave., Berkeley, CA through May 6, 2018.